Many adults include running as a part of their regular exercise routine to maintain weight and heart health. Naturally, the popularity of running trickles down to children, who want to keep up with their parents' times. A 12-year-old cannot expect to run a mile as quickly as an adult, but if he clocks in at a higher percentile than his peers, he can expect to quickly improve as he grows. A 12-year-old boy who can complete a 1-mile run in eight minutes and 40 seconds sits at about the 50th percentile in comparison to other boys his age. Any time faster than 8:40 would be considered a good time, since it puts the boy in the top half of his age class. If the boy runs the mile a minute faster, coming in at about seven minutes and 40 seconds, he rises to the 75th percentile. The best mile time a 12-year-old boy could expect is six minutes, which would put him in the 100th percentile. 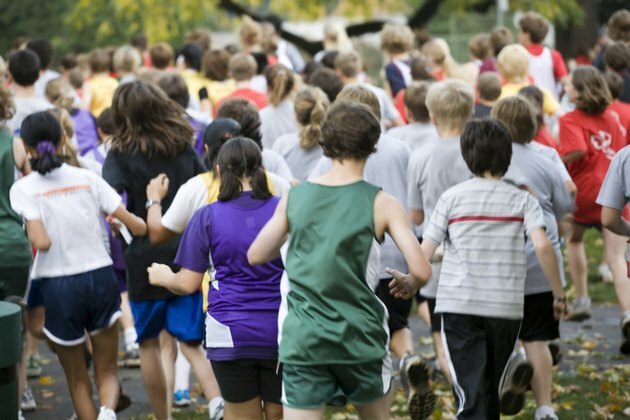 On average, girls tend to run more slowly than boys of the same age. A 12-year-old girl will fall in the top half of her peer group if she's able to complete her mile run in 11 minutes, which is more than two minutes slower than the median time of her male counterparts. For a girl to fall into the 75th percentile and achieve a time that could be considered truly good, she needs to run the mile in nine minutes and 15 seconds. The time gap between boys and girls narrows as the runners get closer to the top percentile. For a girl to be in the 100th percentile of her peer group she needs to run the mile in six minutes and 22 seconds, which is less than a half minute slower than the top tier of boys. As a child grows and nears adulthood, you can expect his mile time to sharply improve. For example, between the ages of 12 and 13, top-tier male runners may see their time improve by about 20 seconds. If the running time of a boy in the 100th percentile is adjusted for age, it compares to an adult male who runs a single mile in about five minutes and 14 seconds. Running is a safe and healthy exercise for 12-year-old kids, but parents and coaches should be careful not to push children to run faster than their comfort level or train to the point of exhaustion. Children who are still growing can damage the cartilage in their knees if they push themselves too hard or wear improper shoes. Children under the age of 10 should stick to shorter distances and avoid running a full mile. How Fast Should You Run a Mile?